Bertus Fourie leaves KWV today to take up the position of managing director at Val de Vie Wines from 1 May 2008. 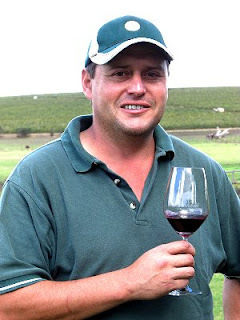 Bertus, who gained the nickname 'Starbucks' in appreciation of his pioneering the coffee and chocolate Pinotage when he was winemaker at Diemersfontein, joined KWV in 2005 as Senior Winemaker and launched KWV's Cafe Culture - a coffee and chocolate Pinotage - last year. Bertus's younger brother, Martin Fourie, is winemaker at Val de Vie and the two are looking forward to working together. Val de Vie is a lifestyle residential estate with a strong focus on wine and polo. Most of the existing vineyards have been replanted with Rhone varieties as these are considered best suited to the area. The cellar building dates from 1825 and houses a 100-ton cellar solely for the Rhone varieties. But plans for a bigger Pinotage-only cellar facility are underway. Martin Venter, developer of Val de Vie Lifestyle Estate, said "We view the appointment of Bertus Fourie as managing director of Val de Vie Wines (Pty) Ltd as an important part of the implementation of our marketing and branding strategy for Val de Vie Wines that coincides with the lifestyle brand of Val de Vie Lifestyle Estate. Interestingly, it was the Coffee-style Pinotage that originally sparked our friendship. It is the friendliest wine that I have ever enjoyed, and all my friends and colleagues love it as well. Like Bertus said at several occasions: 'Selling wine is all about relationships', and what a better way to start any relationship than with this wine." The Pinotage Club met Bertus Fourie last month, click here for the report. Middlevlei Estate are on the outskirts of Stellenbosch at the entrance to Devon Valley. You drive along a pleasant street in a housing estate of spacious gardens and mature trees and at the end of the road is the entrance to the farm. A short brick road leads through vineyards to the winery and tasting room. The estate is owned by the Momberg family. I had an appointment with Jeanerette Momberg who is responsible for marketing. 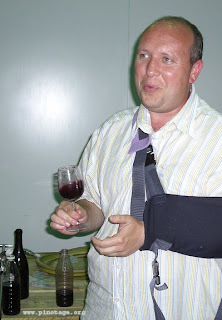 Her husband Ben manages the vineyards, and Ben's brother Tinnie (pictured), is the winemaker. The tasting room has a projecting roof, so we sat outside in the shade and admired the view of vines on the hillside. Jeanerette poured me a glass of Hagelsberg 2007. This is an export label and means ‘Hail Mountain’, which was the name originally bestowed by Simon van der Stel in a storm when he first the hill now planted with Middlevlei’s vines. The same wine is as Brick Road when exported to Germany and Netherlands. Tinnie joined us, bringing this bottle from their cellar with him. The wind was getting up; and odd gust blew over some empty glasses. This eight year old wine smelled older than it tasted. On the palate it was soft red berries, ripe mulberry flavours and that haunting Pinotage sweetness. Lots of life left in this really enjoyable old wine. Thanks to Jeanerette and Tinnie. I'll look out for the 2006 Pinno at the London International Wine Fair in May for a retaste. The first time I went on a river cruise with Fred Viljoen the wind was so fierce that the boat couldn’t make headway, diners wine glasses and food were whipped off tables to delight the fishes and the trip had to be abandoned. But this year the weather was perfect. 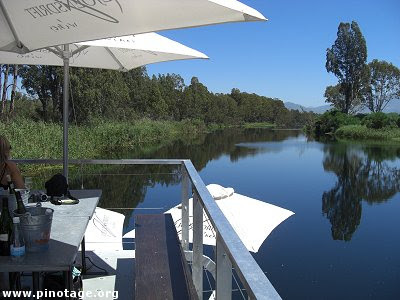 Fred has a spiffy new aluminium boat with two decks and more space, which is needed as these picnic trips along the Breede River have become very popular. There are now several trips a day but even so some people who have turned up without a booking are disappointed. But not too much because they can enjoy their picnic on the river bank. The idea is that you arrive at the riverside forty minutes before departure and order your picnic choices of breads, meats, cheeses, nuts and olives from their delicatessen. Bread is baked to order and the picnic basket is assembled. Then there is the important task of ordering wine and you can hone your choices at a tasting counter. Then it is time to collect your picnic, wine, water, glasses and ice buckets and board. The boat heads down the river until progress is impeded by a weir then back the other way, passing the boarding jetty, until it is time to turn again and head home. The river is peaceful, the scenery changes at each bend. Fish jump, there are birds in the trees, the sun is shining, the sky is blue and there is an ice bucket and chilled wine from Viljoensdrift to sip. It is an idyllic way to spend an hour. There’s creamy cassis, plums and stone fruits in this well made attractive wine, and it has a really nice finish. This is a clean, modern fruit driven wine, and very reasonably priced. Lovely stuff. When you visit the Viljoensdrift website at http://www.viljoensdrift.co.za/ don't miss the eye symbol with the word 'view' on their homepage. Click on that for a virtual tour of the winery and river, where youcan select your view point, including birds-eye views. Clever stuff. 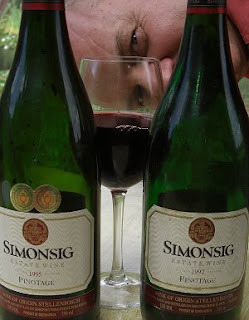 You can find Simonsig wines in more than forty countries, including Russia and even France, as well as many US states. It takes more than just consistently making good wines for a family owned winery to get their products in world markets. 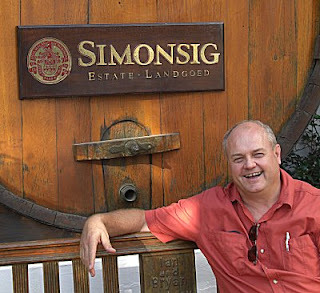 Simonsig’s secret weapon is Pieter Malan, one of three brothers ,along with winemaker Johan and Managing Director and viticulturist Francois, who own and operate Simonsig Estate. 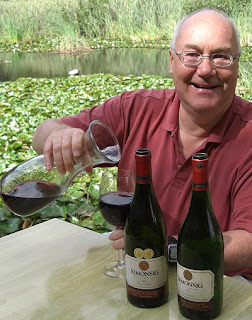 Pieter is a gregarious man who is never short of an amusing tale or sample of wine to pour at the endless wine shows he travels the world to attend. I met Pieter at Simonsig’s re-modelled tasting room. There are major works going on for a new deli-restaurant to be opened soon and I was pleased to see the new building was sympathetic to and fitted well with the existing architecture. We started with a glass of Brut Rosé. Simonsig were the first in South Africa to make a methode champenoise sparkling wine which they called Kaapse Vonkel, meaning Cape Sparkle. “We didn’t trademark the name,” Pieter told me, “We thought it would become the generic name for a South African sparkling wine; after all, we couldn’t use the word Champagne since the crayfish agreement of 1935.” And he then tells me how South Africa signed a treaty where France would import Cape crayfish in return for South Africa agreeing not to use Champagne and other French terms and geographical names on Cape wines. “So that is why you’ll never hear us referring to it as Champagne,” Pieter exclaimed. “But Pieter,” I replied, “When I arrived here and asked for you in your tasting room, the young woman behind the counter asked me if I’d like a glass of Champagne while I was waiting.” Pieter paused a moment, then, roaring with laugher exclaimed “then I’ll have to smack her bottom!” But no other wineries adopted the Kaapse Vonkel name, eventually Simonsig trademarked it, and Methode Cap Classique (MCC) was chosen as the legal definition. Purple rim, really soft and smooth, lots of fruit underpinned by gentle tannins and there is a really attractive spiciness to it. Malolactic fermentation was in barrel, and it spent 16 months maturation in new French and American oak barrels. 14.5% abv. Pieter told me that he’d completely sold out of the ’05 Redhill and when he needed some he’d had to buy them back from a customer. This was a sample from a barrel but was drinking very well and showing great promise, being soft with ripe rich black berry fruits. 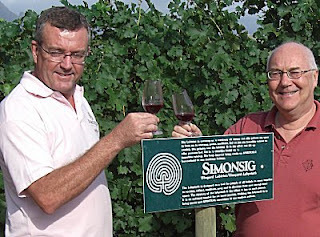 The founder of Simonsig Estate is honoured with the Frans Malan Reserve, a Cape Blend of Pinotage and Cabernet Sauvignon. “Cape Blends are the rocket that fires South African red wine,” stated Pieter firmly. A Cape Blend consisting of Pinotage (65%), Cabernet Sauvignon (31%) and Merlot (4%). A claret nose leading into more sweet fruits on the front palate than you’d get from Bordeaux. A rich experience in a wine that manages to seem restrained as the same time as offering grainy wood tannins and, blackberry fruits with an intriguing linearity and balance. We then went for lunch at the nearby Olivello Restaurant with Pieter bringing two aged wines from Simonsig’s cellar. This is a 16 year old unwooded Pinotage; it looks pale orange in the glass with a clear rim. It has a very delicate flavour, there is some fruit but it is fading; it reminds me of an old Burgundy. A wine to sip and appreciate. Much deeper red colour and a matching more intense fruit, there’s lots of life left init, and it matches will with Olivellos Moroccan lamb tagine. It is pretty amazing for a 13 year old inexpensive unoaked wine. As we drive back up Simonsig’s drive I notice a Union Flag flying outside the winery. “That is in your honour,” says Pieter with a smile. Pieter takes up the hill to see the Redhill vineyard, and with Johan we also admire Simonsig’s vine labyrinth and small exhibition vineyard showing many different grape varieties. As usual there are a number of tour groups in the tasting room. Simonsig attracts overlanders who, after travelling across Africa in expedition lorries, celebrate the completion of their journey at Simonsig, watching in awe as their leader brings a sabre out from the tasting room and slices off the tops of bottles of Kaapse Vonkel to fill their glasses with foaming wine. There’s a richness of soft sweet blueberries and a tangy spiciness in this fruity wine, with some underlying vanilla from 14 months spent in small French and American oak barrels. When I last tasted this wine, in October 2006, I felt it was "going through a dumb stage where the prominence of the fruit has dipped from my earlier tastes". Well it's speaking now. Laibach 2003 Pinotage , which is a 2004 Top 10 winner, is a delightful wine, from a winery that never disappoints. It will keep, but it is lovely drinking now. No one guessed Montana in the United States as the location of this vineyard. And its not surprising as weather there can be extreme. Even the official Montana State website exclaims "Winters Like You Have Never Experienced". 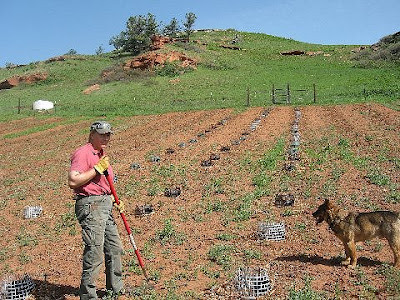 Greg says "we have had about 50 Pinotage plants in the ground for about two years now. In winter, we cover them with a mixture of hay and manure. They survived last winter, and if they come up again this summer, I think we will win! Just imagine: Montana Pinotage!!" Where is this Pinotage Vineyard? 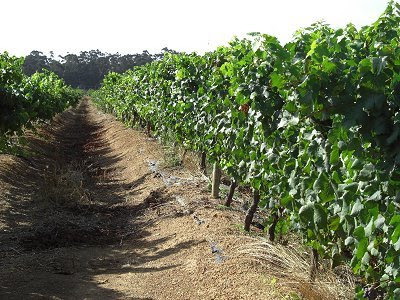 Here's a two year old Pinotage vineyard in a location that might surprise you. The high-flying owner owns a winery in South Africa, but the picture wasn't taken there. Can you guess where in this world it is? This blog is a finalist in the 4th South African Blog Awards! You'll be taken to a the voting page where, at the foot, they'll ask you to put your email address and enter an anti-spam code. Stormhoek, the brand that made its name through blogging, now has two blogs. The original at www.stormhoek.com is probably the one on your favourites list, but it hasn’t been updated for a month now – I reckon it belonged to the now demised Orbital . 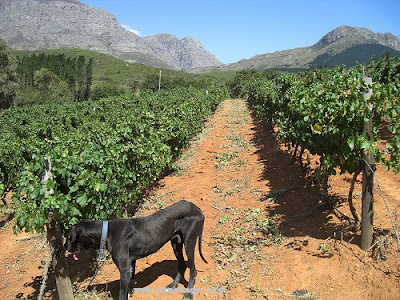 So switch to www.stormhoek.co.za which is being maintained by the winery in South Africa. They’re concerned about their local suppliers being hit by non-payment in the wake of Orbitals collapse and are asking supporters to invest in owning a vine. And, of course, you can choose a Pinotage from their Guava block, pictured below. “When the crunch came in December 2007, R6 million ($800 000) was owed to South African suppliers. The list of unpaids includes the Stormhoek vineyard, the Stormhoek home cellar and in particular, the whole out-sourcing network (label printers, transporters, too many to mention). One thing about bankruptcies. The money is lost. South Africa's wine industry is not rich. Household income, averaged out across every employee: boss, labourer, supervisor, receptionist, driver, manager, foreman, all of them, is less than R2500 per month. None of these businesses can afford to lose R500 000. Stormhoek are asking for supporters to adopt a vine of their choice by investing R2000 (=$270/£130). “You will get a certificate with a photograph of your vine and your name, plus a bottle of wine made from the crop of the vineyard block containing your vine. All of the money raised will go to repaying the Orbital debts to South African grape-growing, winemaking and support services. 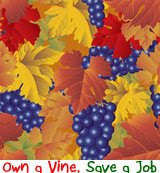 “Own a vine, save a job” campaign logo courtesy of Robert the Bruce, at iscatterlings.com.